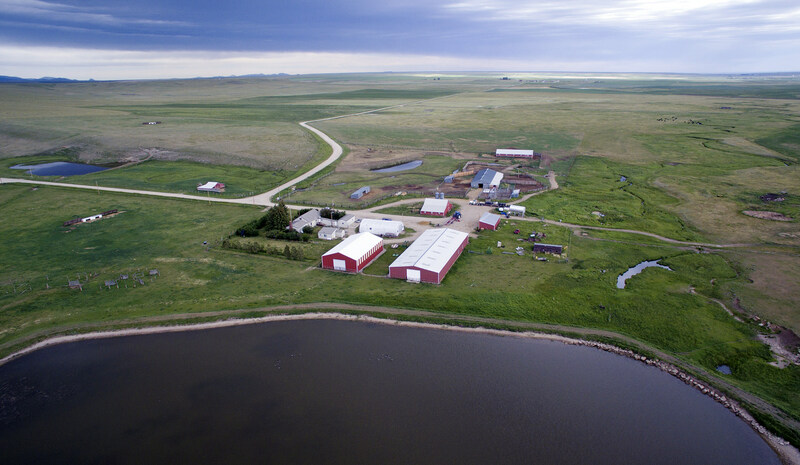 Peterson Ranch is situated in the rolling hills of Central Montana near Buffalo and approximately 30 miles southwest of Lewistown. 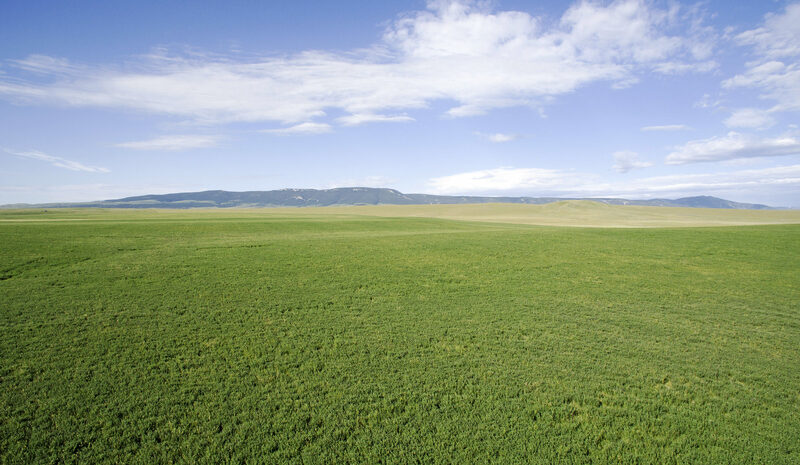 It is comprised of approximately 9,669± total acres, of which 8,549± acres are deeded and 1,120 acres are a State of Montana lease. The Ranch is positioned on the western side of the Snowy Mountain Range and the north slope of the Little Belt Mountains in the famed Judith Basin. 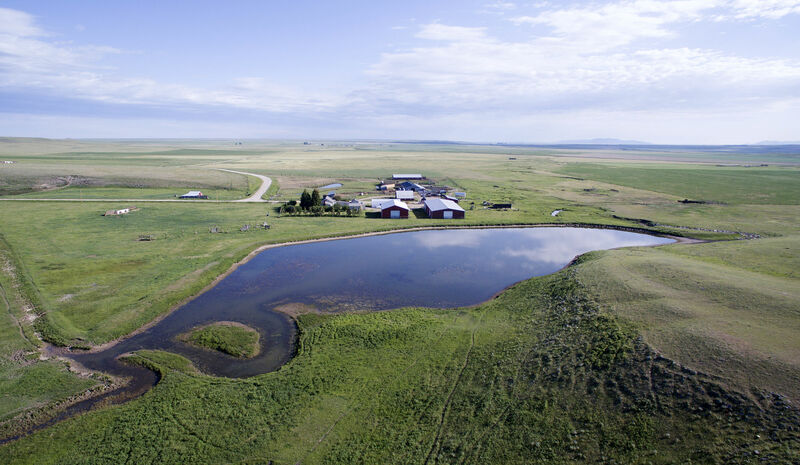 With over 4,012 acres of dry-land farm ground, Peterson Ranch is a rare opportunity to own one of the premier blocked-up and contiguous dry-land farms in one of the Big Sky State’s most productive basin settings. The Ranch is ideally located in one of Central Montana’s most desirable and appealing areas. Judith Basin and Fergus Counties afford all the resources required for successful ranching and personal enjoyment of a safe and quiet lifestyle “far from the madding crowds” of metropolitan America. 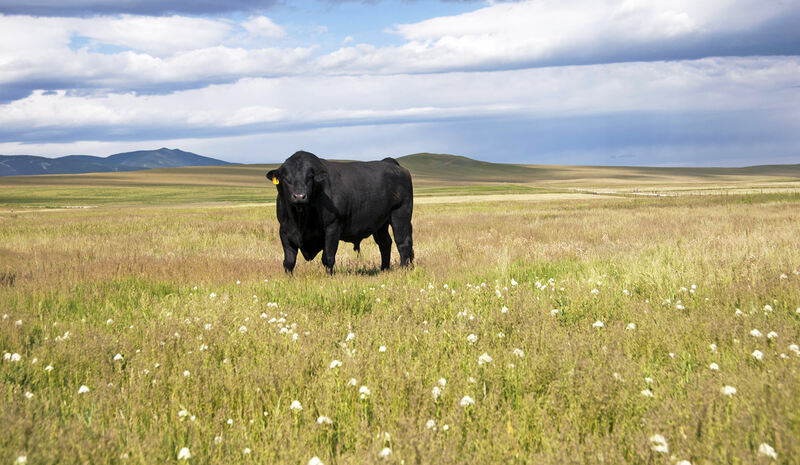 The grass resource has been well managed and it is apparent that the current owners have conservatively managed the Ranch to ensure healthy stands of native forage. The remarkable condition of the range land is the product of years of careful stewardship. The upper reach flow of Mud Creek provides consistent stock water to many of the pastures located along the bottoms. Mud Creek runs into Ross Fork Creek, which also provides water to the north end of the Ranch. The pastures above the creek bottom are well watered by stock tanks supplied by wells. Cattle can access fresh water within a half to three-quarters of a mile in all pastures. The improvements on the Ranch are well maintained and functional. The next owner will not be saddled with expensive homes and outbuildings. 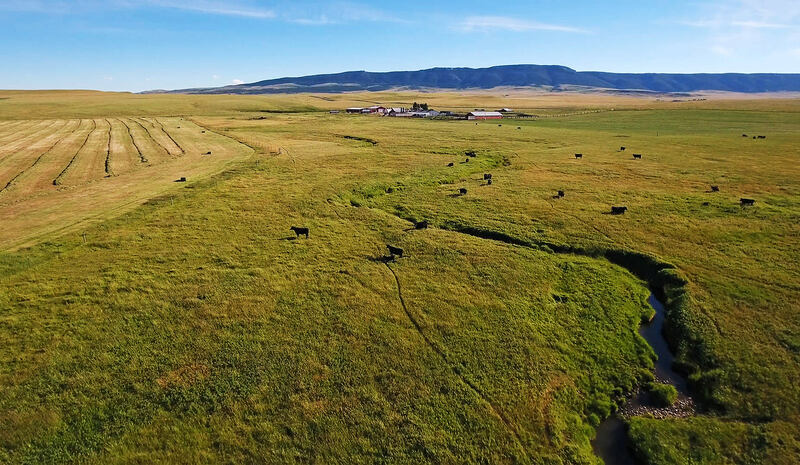 The Ranch is a must see for buyers who are interested in purchasing a premier Central Montana holding in the productive Judith Basin – an area well known for its highly productive soils, consistent moisture levels and close proximity to both the Billings and Great Falls markets. Rarely do low-overhead production ranches make themselves available to the market. Peterson Ranch is a unique opportunity to purchase a solid agricultural production ranch without the bells and whistles of excessive improvements and other non-producing assets. 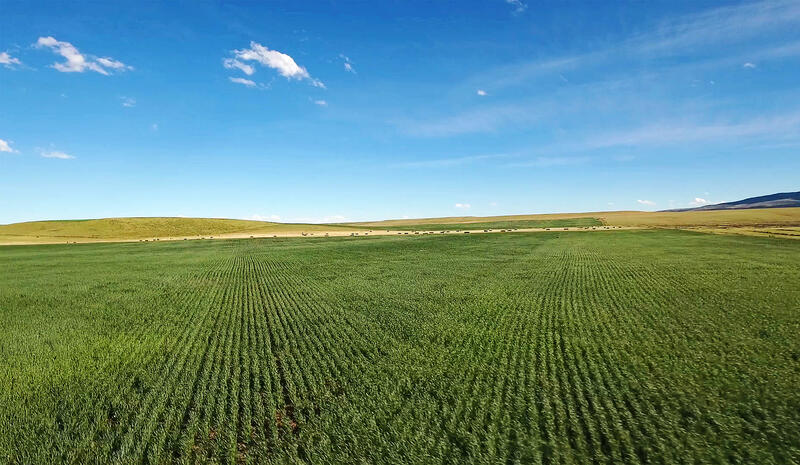 Priced at $1,375 per deeded acre including over 1,120 acres of State of Montana Lease land in crop and productive hard-grass native pasture, this is a must see for an ag producer looking to put on pounds of beef with minimal overhead. Peterson Ranch is positioned about 30 miles southwest of Lewistown – the geographic center of Montana, about 10 miles from the small town of Judith Gap, and less than 2 miles from the unincorporated community of Buffalo. The county seat of Fergus County, Lewistown, with a population of approximately 5,900, offers all the necessary amenities for convenient living. The town provides two machinery dealerships, grocery stores, sporting-goods stores, clothing and specialty shops, coffee bars, fine dining, arts and crafts, and appliance and furniture stores through the tree-lined streets of the revitalized historic downtown. In close proximity to downtown just off of Main Street, the Calvert Hotel, built in 1872, provides fine lodging with a historic and elegant ambiance. Also centrally located is the Yogo Inn which brings fine dining, lodging with a pool, and hosts the Charlie Russel Choo Choo – a dinner train nearby. Exceptional medical care is available at the Central Montana Medical Center (CMMC) in Lewistown, which offers a full-expertise range of physicians and consulting specialty doctors in partnership with the Billings Clinic. The Lewistown Municipal Airport (LWT) is located two miles southwest of Lewistown and is served by Newton Aviation, Central Air Service and Silver Airways. Built by the U.S. Army Corps of Engineers during WWII, the airfield was utilized to train U.S. Army Air Force airmen in the Boeing B-17 “Flying Fortress” before being assigned to air combat missions in Europe and North Africa. The main 6,100' x 100' asphalt runway, which is lighted, is in good condition. There are two additional asphalt runways, one of 5,600' x 100' which is in poor condition, and one 4,102' x 60' which is in good condition. The airport sits at an elevation of 4,170' above sea level and can be contacted on CTAF frequency 123.0 and WX ASOS 118.375 or by telephone at (406) 538-2653. There is easy access to essentials at the nearby towns of Judith Gap and Moore. Both the Moore Farmer’s Co-Op and Judith Gap Oil offer a convenience store, gas station and a service station. Both towns also offer bars, restaurants, as well as a couple of churches. The Ranch is approximately a two-hour drive from two commercial airports – Great Falls and Billings, both which offer good private FBOs. Commercial carriers at the Great Falls International Airport, including Alaska, Allegiant, Delta and United airlines, offer direct flights to seven destinations including Salt Lake City, Denver and Seattle. The Billings Logan International Airport also provides a variety of commercial carriers as well as national and limited international service through Allegiant, Alaska, Delta, Cape Air and United to several major cities including Denver, Salt Lake City, Seattle and Minneapolis as well as others. Peterson Ranch ranges in elevation from approximately 4,210' above sea level along the northeast boundary to approximately 4,675' above sea level on the southwest reaches of the Ranch. On average, there are 152 sunny days per year in Buffalo, Montana. The July high is around 80°F with an average July low around 48°F. The January high averages 26°F with an average low of 3.2°F. In Buffalo, there is an average annual rainfall of 13.6" with the majority in June, and snowfall of 36" with the majority falling in March. The Ranch is well watered with tanks, wells, springs and reservoirs throughout the pastures. Fresh water is accessible to livestock within a half to three-quarters of a mile in any of the pastures. Significant improvements to the watering system were made between 2012 and 2016 using modern technologies and efficiencies. Mud Creek, which originates from the Belt drainage on the Ranch, serves three of the eastern pastures providing consistent live water for livestock throughout the year. Ross Fork Creek from the Snowy Mountain Range runs through the north half of the Ranch. The improvements on the Ranch are modest, functional and appropriate. Peterson Ranch provides its next owner flexibility. In its current configuration the Ranch has run about 500 head of mother cows while generating ample hay to feed throughout the winter. A typical winter will require about two tons of hay to get a cow-calf pair through the winter. In addition, the Ranch will sell about 3,000 tons of hay annually as well as harvest 100,000 bushels of either spring or winter wheat. Historically, the Sellers have calved heifers in mid-February followed by the older cows in early March. Weaning is usually around mid-September with shipping in late October. Steers get on the trucks at around 700 pounds and heifers at about 660 pounds. All improvements on the Ranch, including interior and perimeter fencing, appear to be in good condition. They are functional so the next owner will not have to assume heavy deferred maintenance expenses. Further improvements include domestic water from wells, septic systems, dams, springs, gravel drives, interior roads, fences, and landscaping. A central artesian well provides domestic water for the three homes located at the Headquarters. The artesian well fills a concrete cistern which in turn feeds the houses with clean domestic water. The 1,920± square-foot owner’s home provides four bedrooms, two full baths, a finished partial basement, an office, a mudroom with a half bath, and an attached one-car garage. The home was originally built in 1948 and remodeled in 2015. Upgrades include a new kitchen, new windows with thermal panes, Whirlpool appliances, refinished hardwood floors, and a big open main floor plan. Heat is provided by both propane and hot water heaters in addition to a wood fireplace with a propane insert. Just off of the two-car garage is the Ranch Office complete with high-speed internet. The home has an asphalt roof, maintenance-free siding, its own septic, and shares domestic water from an artesian well with the second home and the cabin. This 1,092± square-foot home was built in 1978 and was completely remodeled in 2015. Upstairs is comprised of one bedroom, laundry and mud room, a fully-remodeled bathroom, kitchen, dining room, living room and an office. The fully-finished basement hosts a large master bedroom, plus two additional bedrooms, another bathroom as well as a recreation room. The home is complete with decks on both the front and the back of the house, and an oversized two-car garage with 9' doors. The home has propane forced-air heat, an individual septic system, and domestic water is provided by the same source as the Owner’s Home. The metal roof is in good condition, and the home also includes newer thermal-pane windows. The original structure was built in 1920 but was restored in 2013 with a new addition that boasts a large master and a smaller side bedroom. With wood floors throughout, the cabin has a full bathroom, a propane stove and electric heat. Typically, the cabin is rented to bird hunters who like to frequent the Ranch to hunt pheasant and Hungarian partridge, or utilized for friends and family visitors. Adjoining the cabin are two RV hookups complete with water, sewer and power connections. The insulated 1,920± square-foot Quonset, on a concrete foundation, is complete with 220-volt electricity, including propane heat and a work bench space. This structure serves as the working shop for the Ranch and handles large equipment well. The steel-framed 4,800 square-foot concrete-floor building is utilized for machinery storage most of the year but then a portion of it can also be utilized for a calving barn. When grain storage runs short, the Seller has even used this structure for flat grain storage on exceptionally high-yield years. This 768' barn is used for cattle processing. Constructed with wood frame with steel siding, it has a partial concrete floor, electricity, and sliding doors at both ends. It houses the hydraulic chute with scales and several sorting pens. This is an older barn with electricity and includes calving jugs, maternity pen, and a warming room. Enclosed lean-to sheds and alley gates are situated along three sides of the barn. The Horse Barn can also be used for calving when necessary. There is a total of 55,000 bushels of storage included in an automated storage facility with four larger bins, some with aeration and some without, all having concrete floors or hopper. A semi loading and unloading facility is conveniently sited as well. The facility includes a 90' single elevator leg that connects a large hopper to grain storage bins. Additionally, there is 6,000 bushels of grain storage in smaller bins that are not included at the main grain facility. Certified at 50,000 pounds by the State of Montana, the livestock scale is located directly within the corral system. It is composed of a steel frame and has a concrete decking. There is a well-designed system of pipe corrals in place that were built in the early 1990s. Designed to efficiently work and process cattle for either weaning, shipping, weighing or vaccinating, they are functional and in good working order. In addition, integrated into the working corrals are several backgrounding lots of various sizes. The current configuration provides for a maximum capacity of about 1,000 head of yearlings. 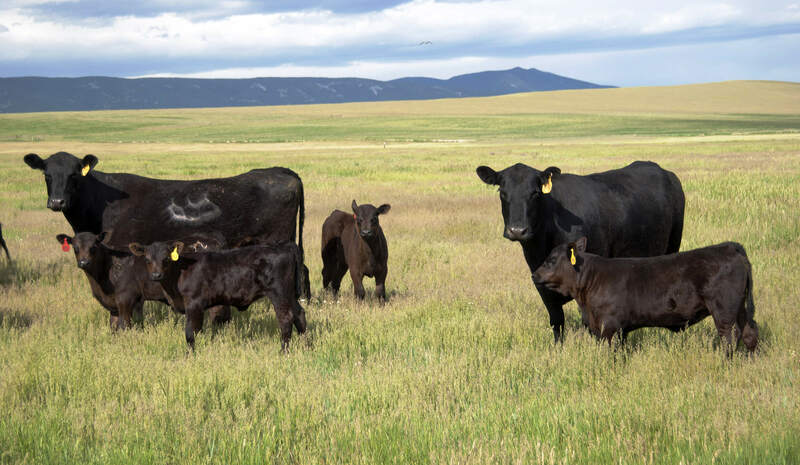 It is important to note that the Peterson Ranch working corrals and livestock scale is a certified shipping point as determined by the Montana Department of Livestock. A 135-ton semi-truck Rockwell scale is located near the entrance of the Headquarters. The truck scale is certified by the State of Montana and has a 60' platform to weigh tractor-trailer rigs hauling cattle, hay or grain. Several smaller or older outbuildings, a fuel storage and grain bins are also on the premises. The fuel storage facility meets all current Department of Environmental Quality standards for bulk fuel storage. The main home, located at the headquarters of the Ranch, was completely gutted and remodeled in 2012. The 3,000 square-foot home has four bedrooms, two full bathrooms and an attached heated one-car garage. The kitchen, with Formica countertops and Pergo flooring, had new appliances installed in 2012, and offers plenty of storage space with new cabinets and an island with a sink and bar-counter seating. The home is well insulated with recently installed fiberglass batting and heated with electric heat. The Culligan water conditioner, which is leased, and the Culligan water purifier are located in the basement. The master bedroom, second bedroom and two bathrooms are located on the main level, and two additional bedrooms are located upstairs. A recreation room, with a vaulted ceiling and a wood burning fireplace, was updated during the remodel. The bunkhouse is currently utilized as an office. With two bedrooms, a bathroom and kitchenette, it is also ideal to house working cowboys. Hot water is supplied via an electric hot-water heater and a propane tank-less hot water system; and heat is electric. At one point the Ranch ran a herd of about 50 buffalo; at that time this building operated as the meat-processing plant, but has since been remodeled and converted into living space. With the original cooler and freezer still intact, the building could be restored back to a meat-processing facility. Installed in 2013, the cattle-handling facilities, located at the main headquarters, are very functional. Significant improvements have been made by the Seller. Custom built 2W corrals, which are bolted to the concrete alleys and the double-alley bud box, which allows cattle to move through and the gate to close behind them, are very well designed. There are two alleys which lead into the FM squeeze chute. The system is adjustable to work with different-sized animals. All of the old corrals were rebuilt with wood and steel construction in 2013. The Quonset Shop, which has electricity and is heated with a Modine propane heater, is currently utilized as a storage facility. Built in 1982, the insulated loafing and calving barn is designed and utilized as a calving facility with 20 jugs. The large 16' x 14' and 16' x 20' sliding doors on either end of the building allow for easy access to the building. To hold more animals, additional panels and jugs could be added to the barn annex. The loft allows for additional storage for hay and straw. The barn also has a vet room with electric heat, a large sink with a hot water heater and a refrigerator. The three lighted dry lots off of the barn are used as day and night calving pastures. The facility has the capacity to bring in 400 head of cattle at night and split them up into the three lots. New fiberglass insulated tanks, which are fed from the well, serve the three lots. Built in 1952, this large pole-frame barn with electricity has concrete post foundations and a dirt floor where additional jugs can be added. Built in 1979, this 50' x 100' wood-framed structure with metal siding, utilized as a machine-storage shed, has a gravel floor and no electricity. There are overhead doors at each end of the building. An electric opener on the front door is powered by an extension cord from another building. The 8,400 square foot, 75' x 150' building with a concrete floor is used for machine storage and flat grain storage when necessary. The lighted shed has a steel clear-span frame with 2" x 6" connectors on the roof and walls. It is large enough to fit a full-size tractor-trailer rig. The shed has five overhead doors including 18' x 18' roll-up doors on either end of the building – electric on the front door and manual on the back, and three large manual roll-up doors on the west side of the building. The shed also has 220-volt power. Built in 1969, the four-bay garage has four overhead doors, concrete floor, electricity, and wood-frame construction with metal exterior. Built in 1952, the wood-frame granary/barn has concrete floors and is used for storage, primarily of livestock salt, minerals and tack room. Built in a circular formation, six 10,000-bushel grain bins surround a central dump pit in the center. Grain is unloaded at the center point and can be distributed to any of the six bins. The facility is very well designed with the hopper bin for wet grain, the grain dryer, augers and the large grain bins for efficient processing. Originally built in 1998 and remodeled and updated 2018, this triple-wide air-conditioned modular home on cinder blocks with skirted sides has four bedrooms and three bathrooms. The small but functional kitchen, with Maytag appliances, offers plenty of cabinet space and a breakfast nook. Off of the kitchen is a separate dining area and a large living room. A separate recreation room was added as an addition. The master bedroom has a generous-sized master bathroom with a soaking tub and spacious closet space. The north-facing porch is ideal to relax outside. The heated over-sized two-car garage built on a foundation is ideal for vehicles as well as extra storage space; and the nearby storage shed is convenient for yard equipment. The house has two propane forced-air furnaces. Located near the manager’s home is a large 100' x 75' shop. Heated with propane, two overhead high-output forced-air blowers are on individual thermostats. The shop offers easy access for large equipment with a large 32' x 40' roll-up overhead door. The building also has a bi-fold airplane door as well as two 18' x 18' doors on each side of the building. All of the equipment doors are operated with electric motors. There is also an attached annex with an office and a bathroom with an electric hot-water heater, as well as a lawn-mower garage. The shop has 220-volt electricity, an air compressor and floor drains, and an individual well and septic system. At the Headquarters, a deep 35-gpm artesian well drilled in 2012 provides an abundant source of water for the working corrals, backgrounding yards and the surrounding grazing pastures. A well thought out system of waterlines and stock tanks were constructed in 2005 throughout the Headquarters to take advantage of the consistent water the artesian well provides. Located near the Improvements, fail-safe measures were implemented should this water source ever falter. Two additional older wells are located near the artesian well which could be easily activated to provide backup livestock water to all of the aforementioned locations within the Headquarters. All of these wells are piped to where water sources could be changed with several valves located in a contained concrete-vault structure. Just south of the B&H Unit, significant improvements to the reservoir and spillway were completed in 2012 by Youderian Construction. The reservoir was reconstructed, and the spillway was completely rebuilt with heavy rock and fabric. Also, in 2012, a new solar water-pumping system located on the bench on the far northwest on the B&H Unit, was installed to water two main summer pastures on the west side of the Ranch. In 2016, two new water tanks were installed 3/4 mile below the pumping station and the pipeline leading to the tanks was repaired. A new water tank connected to the pipeline water system at the Headquarters was also installed in 2016. The homes and the livestock facilities are on two separate wells. Ross Fork Creek, which runs through the Ranch, flows for approximately eleven to twelve months out of the year depending on the rainfall. Mud Creek, which originates on the B & H Unit, serves three of the southern pastures providing good live water for livestock for the southern part of the B & H Unit throughout the year. The Seller hereby makes known that there may be variations between the deeded property lines and the location of the existing fence boundary lines on Peterson Ranch. The Seller makes no warranties with regard to the location of the fence lines in relationship to the deeded property lines, nor does the Seller make any warranties or representations with regard to specific acreage within the fenced property lines. The Seller is selling Peterson Ranch in its “as is-where is” condition which includes the location of the fences as they now exist. Boundaries shown on any accompanying maps are approximate. The maps are not to scale and are for visual aid only. The accuracy of the maps and information portrayed thereon is not guaranteed nor warranted. The real estate taxes for 2018 were approximately $12,000. The Seller will convey with the Ranch one half of all mineral, oil, gas, geo-thermal, hydro-carbon and gravel rights that they own with the Property, subject to reservations by previous owners. They make no representation as to the quantity or quality of any mineral or other subsurface rights appurtenant to the Ranch. The only active mineral lease is a 20-acre gravel pit permitted by the Montana DEQ in cooperation with Fergus County for gravelling county roads. The Seller wishes to retain 100% of the royalties tied to this gravel pit. Electricity is provided by Fergus Electric Cooperative in Lewistown. The Ranch has fiber-optic cable serviced by Triangle Telephone to all of the homes on the Ranch. Cell service with Verizon Wireless and Mid-Rivers Communications is available at most locations on the Ranch. Five propane tanks are leased from Central Montana Propane, four others are owned and will sell with the Ranch. Trash disposal service is available from Lewistown. The 3,500-gallon bulk-fuel storage facility, which is filled by Judith Gap Oil, will hold a tanker load of red-dye diesel. The tank is owned by the Seller and may be available to purchase via a separate bill of sale. The stock water rights consist of wells, springs, developed springs and ground water stock ponds. Please contact our Bozeman office for a detailed report of water rights regarding Peterson Ranch. One of the many appeals to living in Montana is its outdoor recreational opportunities. Just 30 miles away from the Ranch, Ackley Lake State Park, with beautiful views of the Little Belt and Snowy Mountains and the surrounding agricultural land, offers boating, ice fishing and picnicking. An hour’s drive from the Ranch, Crystal Lake in the Big Snowy Mountains at an elevation of 5,700 feet, boasts trails for hiking, horseback riding and biking, while the stocked lake invites fishermen and non-motorized water crafts. World-class fly fishing can be enjoyed from the multitude of spring creeks, rivers and lakes in the region. The blue-ribbon water of Big Spring Creek, which flows through Lewistown, sustains a strong population of rainbow and brown trout. Big Spring Creek is one of the largest fresh water springs in the United States. It originates southeast of Lewistown and provides devoted anglers with 26 miles of pristine water to enjoy. During the summer and fall months, nearby towns celebrate Montana’s culture with fairs, festivals and rodeos. The town of Stanford unites in mid-July at the Russell County Fairgrounds for the C.M. Russell Stampede, which includes a PRCA rodeo, street-dance entertainment, art auction and a barbecue. The first Saturday after Labor Day, Lewistown ushers in the fall with the annual Choke Cherry Festival which is attended by over 5,000 people from near and far to enjoy live entertainment, food vendors and craft booths. The first permanent structure of the Judith Basin was built in 1874 in anticipation of the government plans to designate central Montana as a new reservation for the Crow Indian tribes. This trading post and stockade was named Fort Sherman. Less than a year later, the fort was sold, dismantled and floated down Spring Creek to be reassembled northeast of Camp Lewis – the area that the Army had established to protect the freight outfits traveling along Carroll Trail. Both the route and Camp Lewis were short-lived due to several factors such as inclement weather that halted freight lines, the attack by a Sioux war party on the Camp, and a large prairie fire which decimated the land. Although travelled through by Chief Joseph and his band of Nez Perce Indians in 1877, the region did not begin to be re-established until 1879 when a group of Metis traveling in their “Red River Carts” began to settle the area that came to be known as Lewistown. Francis A. Janeaux, a French Canadian licensed trader married to a Metis woman, built a trading post at what is today Third Avenue North and Broadway Street in Lewistown. Many historians credit Janeaux, with being the founder of Lewistown. Realizing the need to educate the children of the growing community, Janeaux opened a log schoolhouse in 1881. By 1883, the population had grown to a point where the school needed to expand and Janeaux donated a parcel of his own land to construct a framed schoolhouse. The discovery of gold in the western states had a significant influence on many of the early settlements and Lewistown was no exception. Gold was discovered in the nearby Judith Mountains during the early 1880s, bringing throngs of prospectors and settlers to the Fergus County region. For many years, this area was known as the best gold country in Montana. With the population growth of Central Montana and the ongoing Indian conflicts, the U.S. Army established Fort Maginnis, an Army Cavalry post, in the early 1880s. Despite the fact that we had to carry guns on our mowing machines, hay wagons and everywhere we went, we managed to accomplish the necessary work to keep the ranch going. Robert M. Horne, “James Fergus – Frontier Businessman – Miner – Rancher – Free Thinker” - page 136. It is to damn bad about those horse thieves...the only course is for five or six or seven more men to follow as fast and as far as they can travel so they can overtake them if possible. If they cross the boundary it is not safe to follow them far across that region being in a state of war. By 1884 the cattlemen of the region realized that an organization was needed to promote their interests both politically and among ranchers. Fergus played an instrumental role in the creation of the Montana Stock Growers Association and remained active in the organization until his death. The cattle industry was becoming a major industry in Central Montana, grass was plentiful and water was abundant – Fergus County was for many years a leading cattle-producing county in the Western United States. 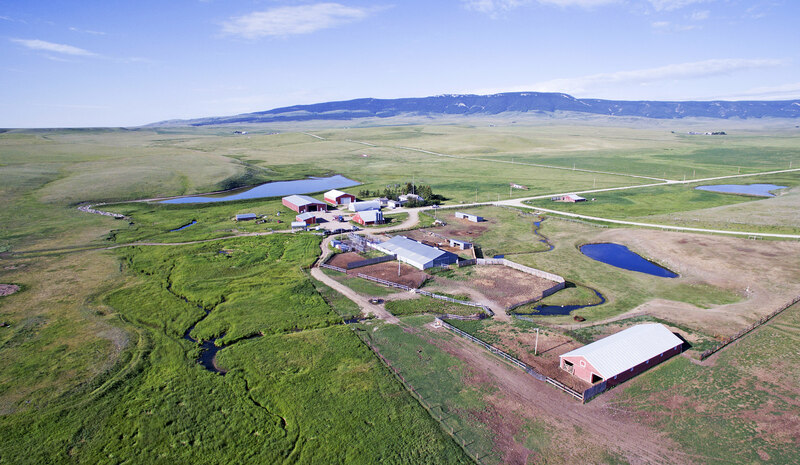 Peterson Ranch will be an attractive option for the individual desirous of a low maintenance, productive and easy to manage ranch property that can be purchased at the right price. The Ranch would afford a new owner the option of “closing shop” during the winter months if they so choose. Peterson Ranch provides its next owner options – running stockers during the late spring to early fall, and grazing off the hay meadows versus a full-blown cow-calf and haying operation. 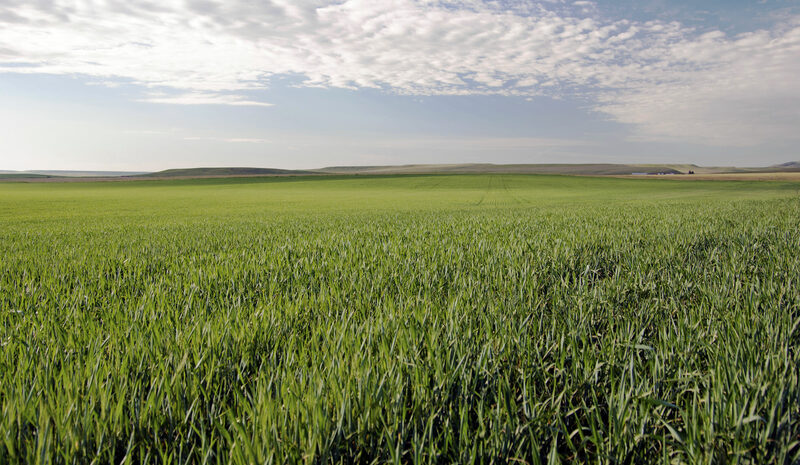 Having the option to operate the Ranch as either a livestock operation or to grow high-quality hay and grain crops provides flexibility to the new owner to take advantage of the agricultural-commodities market. 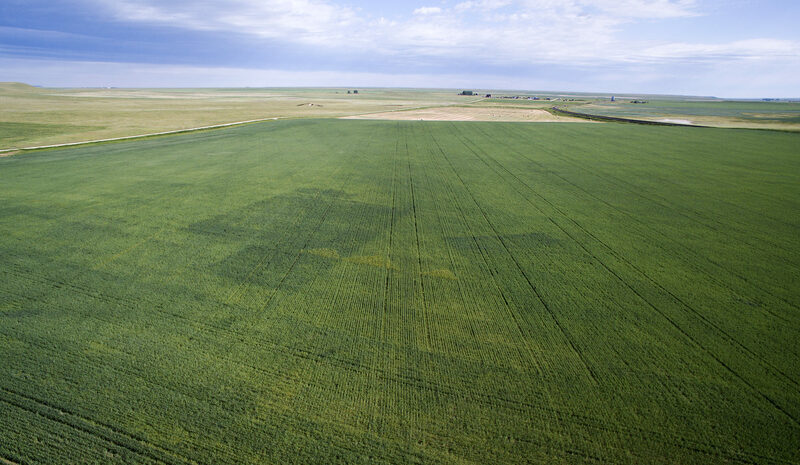 Flexibility on a low-overhead ag operation can be difficult to find in today’s market. The Ranch provides all of the amenities to create true value in one of Montana’s premier ranching and recreational areas. 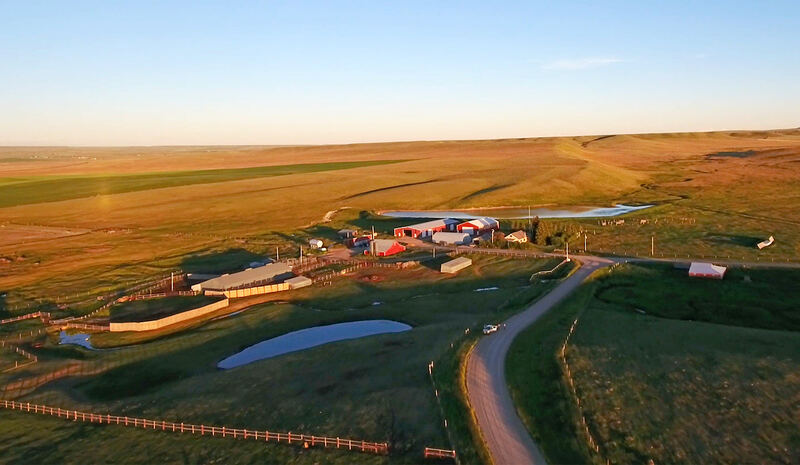 With short commutes to the cities of Great Falls, Helena and Billings, and Lewistown less than a thirty-minute drive away, Peterson Ranch is well situated at the crossroads of Central Montana. Those who have tracked ranch values in Central Montana for the past several years will find the offering price of the Ranch to be very competitive in today’s market. 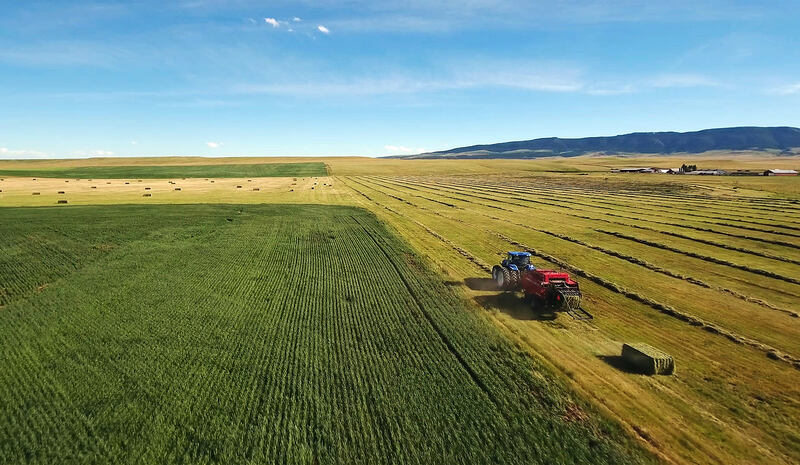 Offered at $1,375 per deeded acre, inclusive of 1,120 acres of State of Montana Leased land and improvements, this is truly a value buy in today’s active agricultural real estate market. Depending on management practices of the new owner, Peterson Ranch will conservatively generate a 3.00% to 4.00% cash-on-cash return on investment running it as a cattle, grain and hay operation. The Seller believes similar or higher returns may be realized converting the existing farm land to improved pasture and running more cattle. A Pro-Forma on the Ranch would be available for serious buyers only after execution of a Non-Disclosure Agreement. The Seller would offer the Ranch for sale on a cash or terms deal. A possible terms deal would be subject to approved credit by the Seller and at their sole discretion. Buyers’ Brokers Are Welcome and Cordially Invited to Contact Michael S. Swan for Information Regarding Cooperation Policies and Commission Splits.